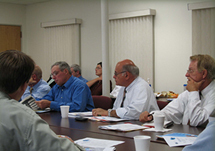 CMRPC hosts a variety of Planner’s Forums where local city and town planners meet at the Commission office to discuss local planning issues and exchange ideas. Visit the CMRPC Calendar of Events for details on upcoming Planner's Forums and Workshops. For more information on Future Planner's Forums, contact Trish Settles at tsettles@cmrpc.org.